How does it win by such a huge margin with only 25 extra horsepower? 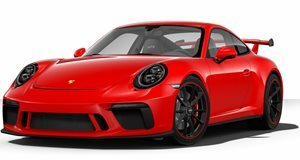 The Porsche 911 is the greatest physical embodiment of the statement mothers always repeat to judgmental children, “it’s what’s on the inside that counts.” That’s because for the most part, the Porsche 911 hasn’t seen the same sorts of radical styling changes in its 54 years of existence that almost every other car has gotten, retaining the same basic silhouette and layout. The benefit to this, however, is that it allows the engineers to constantly improve and beat previous similar-looking 911s by a country mile rather than start with a blank slate. In this case, Porsche comes to us with a huge announcement: the new 911 GT3 has beaten its predecessor around the Nurburgring by 12.3 seconds with a lap time of 7:12.3. Let that sink in for a moment because if you don't know your cars too well, it's worth noting that this sort of time difference makes it seem as if the previous 911 GT3 has square tires. With a 4.0-liter flat-six engine churning out 500 horsepower and 338 lb-ft of torque, this GT3 only makes 25 more horsepower than its predecessor and weighs nearly the same. Though it looks almost identical on the outside, the huge discrepancy in lap times alludes to the the other impressive tweaks Porsche engineers made to the car. Frank-Steffen Walliser, Vice President Motorsport and GT cars at Porsche, elaborated, saying, “By achieving this time, we have emphatically proven that the new 911 GT3 not only provides the best driving experience, but can also deliver an impressive performance on the Nordschleife. The focus was on optimizing the driving quality and adapting to the slight increase in engine power.” These adaptations include rear-axle steering, carbon ceramic brakes, Michelin Sport Cup 2 N1 tires, and aerodynamics tweaks like a carbon fiber rear wing, front spoiler, and a rear diffuser to help the rear-wheel drive coupe better stick to the tarmac and provide the driver with as much joy as there is fuel in the tank. While the new 911 GT3 is available with a six-speed manual, lap times like these require the seven-speed Porsche PDK transmission to be spec’d. Thanks to Porsche, the world now knows that big changes don’t always come as a result of big horsepower additions. Check out the lap for yourself to see how a great car and a great driver break records.